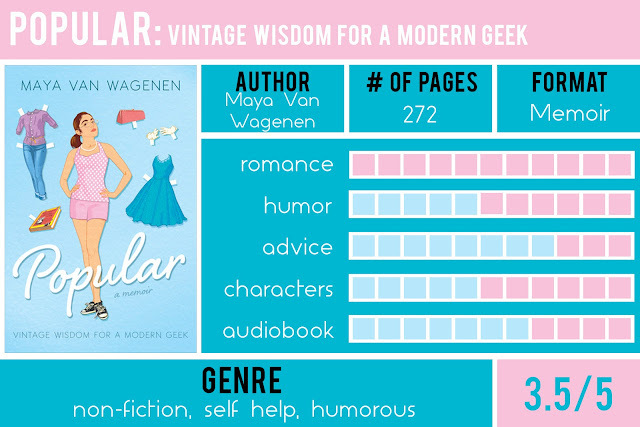 Stuck at the bottom of the social ladder at pretty much the lowest level of people at school who aren’t paid to be here, Maya Van Wagenen decided to begin a unique social experiment: spend the school year following a 1950s popularity guide, written by former teen model Betty Cornell. Can curlers, girdles, Vaseline, and a strand of pearls help Maya on her quest to be popular? The real-life results are painful, funny, and include a wonderful and unexpected surprise—meeting and befriending Betty Cornell herself. Told with humor and grace, Maya’s journey offers readers of all ages a thoroughly contemporary example of kindness and self-confidence. Q: Maya seemed to be very aware of her standing in the social ladder. Were you as aware as her in middle school? A: To some extent I think we all had some idea of how unpopular we were in middle school. We all laughed at how dorky we really were, the weird fashion trends, hair and makeup. We all thought we were a lot cooler than we really were. Q:Why do you think Maya started changing her physical appearance first? Do you agree? A: By changing her weight, the way she dressed, and putting on makeup it gave her more confidence to approach her peers. We all agreed that we probably would have done the same. Q:Why do you think a lot of people were mean to her? A: People can be so mean! As we discussed our own experiences in middle school we came to the conclusion that the meanest people were the most insecure about their own lives, and bringing others down justified their own insecurities. Q: What advice would you give yourself to get you through middle school? A: Middle school was such a hard time for so many of us. We thought it was maybe a little more inspired than coincidence that her parents gave her that book. It included a lot of advice we would like to tell our younger selves. People love to hear themselves talk, so if you are genuinely interested and ask a lot of questions, they will feel at ease around you. Don’t worry so much about trying to fit in all the time! Maya found it more important to stand out and be memorable than to fit in and be forgotten. Q: How is popularity different for kids now? A: There’s so much that is the same from when we were all young — like the sports we played, how we dressed, our looks, and our timeline of when we developed. These things all still factor into popularity today. We all agreed in today’s world with social media and phones, the pressure of being perfect and popular is so much stronger. Q: What was one of our favorite quotes of the book? A: “No popularity exists when tragedy strikes. All that’s left are human hearts and love and ache. We all love each other, deep down, and when we see another soul in pain we can’t help but hurt too.” Thinking back to tragic events in history like 9/11 it really did bring so many people together. What great insight for a girl her age. Q: Did you think it was interesting that the eighth grade class all gave the same answers to what makes someone popular but no one thought that they themselves were popular? Q: Would we recommend this book to someone else. A: We all enjoyed this book but agreed we would probably only recommend this book to a younger audience. It contained such valuable lessons that we wish we could have heard at that age. CONTENT: Very clean book. I would feel comfortable recommending it to a very young age group. Prior to the packers can come, take more time to disclose your home room in your home just by room in your home together with de-clutter. A reliable packers and movers company in Noida, delhi, Ghaziabad, Indirapuram, faridabad, girgaon etc. Ask for best best quotes for relocation services within India. We offers household shifting, corporate office shifting, industry relocation services in India.